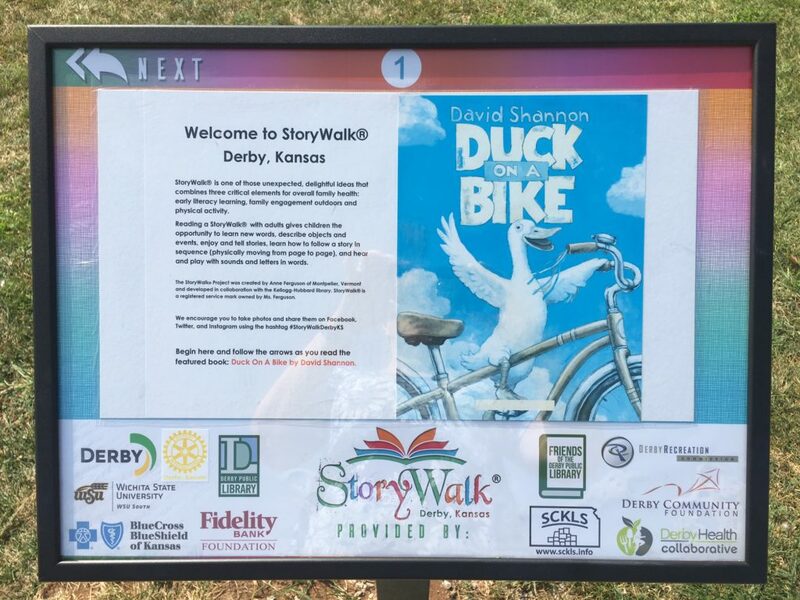 As a kid I remember walking the one block down to our local library. My sister and I would spend hours every week browsing the shelves and picking up more items. One of my favorite items was Anne of Green Gables starring Megan Follows. Anne was so imaginative and fun. I wanted to be her or at least be her best friend. I watched the VHS all the time. I was so happy when I started working here that we have a copy on DVD, which I have checked out multiple times. 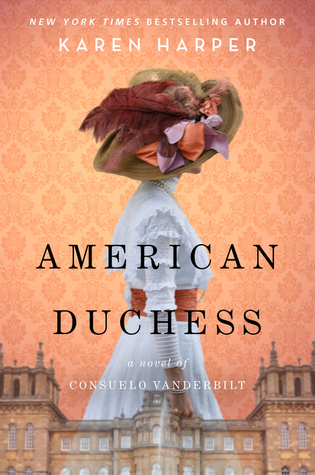 When I saw that there was going to be a “prequel” to the Anne novels, delving into the girlhood of Marilla Cuthbert, I was immediately interested. I needed to read this! I hope that if you love Anne as much as I do that you will enjoy this look into life at Green Gables. First line: It’d been a rain-chilled May that felt more winter than spring. 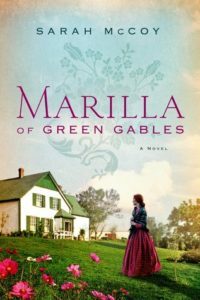 Summary: Before Anne there was Marilla of Green Gables. Marilla is an intelligent and strong willed young woman. She is just starting to venture into adulthood and a budding relationship with the handsome, John Blythe. When her mother dies in childbirth Marilla is left as the matriarch of the Cuthbert home. Even with her new responsibilities, Marilla ventures forth into the world and sees that there is more than just Avonlea. Highlights: I recently read the books for the first time and enjoyed following Anne through her imaginative life. McCoy’s book is a perfect companion to the original story. We get to know Marilla in a completely new way. She was young and was in love. I remember hearing Marilla talk about how John Blythe was her beau, which always made me wonder what happened. I am so happy that I was able to take a look into her past. The writing was very well done. The author stayed true to the times and added little details to flesh out the Cuthbert’s lives on Prince Edward Island. I never realized how much Canada was involved in the Underground Railroad and the path to freedom for so many escaped slaves. As a narrative and a historical fiction book, this is a fantastic read! Lowlights: It was so short! I could have read so much more in this world. Maybe it is time to revisit Anne and Gilbert? FYI: Perfect for fans of Anne of Green Gables! The last several months have been filled with the project of weeding and shelf reading the juvenile non-fiction books. This is quite a daunting task since there are TONS of books! 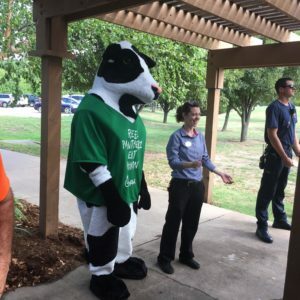 I was ready to take on the challenge though. As I have been working my way through the Dewey decimal system I have found some very interesting books. 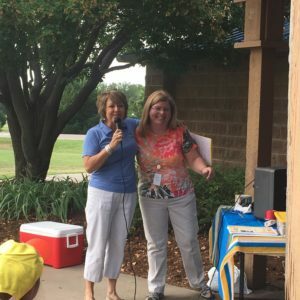 Even though they are titles geared towards children there is so much good information to be found here. 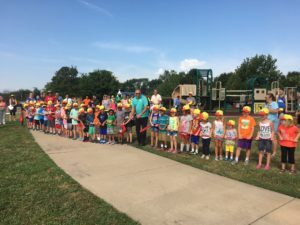 And the fact that kids LOVE to check these out is wonderful! If you have not browsed our children’s non-fiction titles you definitely should. I am someone who likes to learn a little bit while I read. Before I started working at the library I read mainly historical fiction. I love learning about the history of people and places. 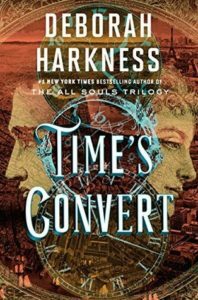 Deborah Harkness’s newest book, Time’s Convert, is my latest historical fiction but with a fantasy twist. First line: On her last night as a warmblood, Phoebe Taylor had been a good daughter. 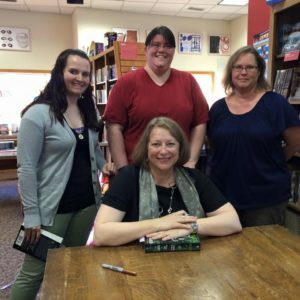 Summary: In continuation of her best-selling series, Deborah Harkness takes us on an adventure spanning from the American Revolution to modern day as we follow the early days of vampires, Phoebe Taylor and Marcus MacNeil. Marcus grew up in time of great change. He saw the birth of a new country but when he meets Matthew de Claremont on the fields of battle his life was changed forever. Phoebe, an art dealer and Marcus’s fiancé, has made the decision to become a vampire. In the early days after her rebirth, she learns that her journey to immortality is not any easier than it was for Marcus. Highlights: I love Harkness and her writing. It is immediately engaging. I read the All Souls Trilogy several years ago which made the details of the story a little fuzzy. However, as I started this newest installment she gave tidbits that helped me remember more of the previous novels storyline. I was worried that in this new book I would not get to revisit characters like Matthew and Diana because the story focused on Marcus and Phoebe but Harkness must have known I would always want more of them. She alternates her chapters between the characters and plot lines. We jump from eighteenth century to the twenty-first and back again. I have been fascinated with the American Revolution since middle school. I was pleased that Marcus’s story took us back to the American colonies and the fight for liberty. I enjoyed reading as Marcus met famous people of the time including the Marquis de Lafayette. After seeing Harkness at a Watermark event a few years back, I learned that her focus of study is on the history of science. It really comes through during this time when Marcus, as well as the nation, is dealing with a small pox epidemic. The history of inoculations for the disease was fascinating and fit perfectly into the story. I am so glad that small pox is not something that we have to worry about now because it looks truly frightening! Phoebe is a character that I vaguely remember from the trilogy but I cannot say that I felt too strongly about her. In this book, she has a fascinating story. I loved seeing her progress as she fought her urges and dealt with the new strengths. Her first night out in the world interesting. In addition, her preference for the blood of middle-aged white women definitely made me laugh aloud! Matthew and Diana’s twins were probably my favorite part of the story. Each of them have their own traits from both their mother and father. Watching their parents try to figure out how to deal with a daughter who drinks blood and son who can weave spells was entertaining. I do not want to give too much away but I hope you enjoy them as much as I do. Lowlights: I wish I could get more Gallowglass! He makes a few appearances but not enough for me. Maybe the next book?! Please Deborah!! FYI: Lots of blood, violence, magic and some sexual situations. First line: Two small pairs of boots echoed on the afternoon cobblestones—one pair in a sprint, the other in a stumble and slide. Summary: We all know the story of the little mermaid who falls in love with a prince but what we do not know is what happened before. After the disappearance of her friend, Evie continues to blame herself. However, when a young girl suddenly appears in their city who has a striking resemblance to Anna, Evie believes that miracles do come true. This stranger though has a few secrets. She must gain the love of the prince within four days or disappear into the ocean forever. Highlights: The cover art is stunning with its mysterious purple eyed witch. I did not even have to read the synopsis before I knew that I wanted to read this. I loved watching The Little Mermaid growing up! My cousins and I would pretend to be mermaids while swimming at the pool. 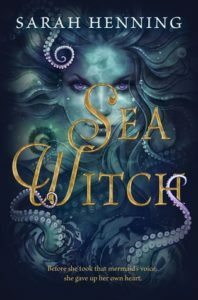 The sea witch was always very creepy and now we get her back-story! The history of the country and its culture was very interesting. The reliance on fishing and the sea is something I am not familiar with (being from Kansas). My favorite part was the flashbacks to when Anna went missing in the sea. It gave us a look at who our characters are and what drives them. Lowlights: There are some dark elements to the story but they do not appear until the end of the story. I expected a little bit more since we were getting the back-story of a villain. And the narrative was very much young adult. They are teenagers who are worried about falling in love. Ok, great. But I want more sea witch! 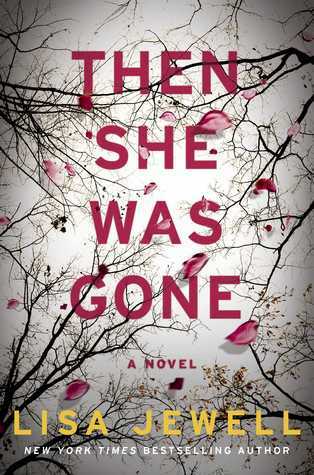 FYI: This is a debut novel for Kansas author, Sarah Henning! First line: Serina Tessaro stood on the steps of the fountain in Lanos’s central piazza flanked by nine other girls her age, all in their finest gowns. Summary: In Viridia girls are not allowed to read, they must be subservient and bend to the will of men. 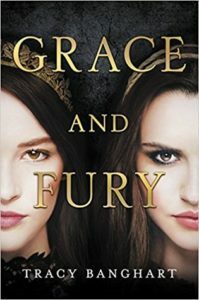 When sisters, Serina and Nomi, are sent to the palace with a chance of being a Grace and her handmaiden, Serina sees this as a chance to take care of her family. However, when the Heir chooses her younger rebellious sister, Nomi, as a Grace instead, their worlds are changed forever. When Nomi breaks the rules, being able to read, and her sister is the one who takes the blame and is sent to the women’s prison on the isolated island of Mountain Ruin. Nomi has to learn to be a Grace while living under the roof of the Superior while Serina is forced to fight for survival. Highlights: I found this very enjoyable. I would classify it as a dystopian novel. Going into it, I thought there would be an element of fantasy to it. To tell the truth I was fine without it. It was good straightforward story. I liked the relationship between the two sisters. They truly care about each other and are willing to sacrifice themselves to save the other one. So many stories are centered on romance but this was sisterly love. Each sister had their own strengths that sets them apart. The action was well done. Not overly gruesome or gory. The cover art is beautiful. I enjoyed the supporting characters such as Maris, Malachi and Jacana. I am hoping that we get to see more of them as the story goes on. I raced through the ending. It was fast and gave a cliffhanger that leaves me wanting more! Lowlights: Several plot lines were predictable. There were similarities between other books of this genre. Even with the similarities, I did not feel like I was reading a rewrite of another novel. FYI: Perfect for readers of The Selection by Kiera Cass and Red Queen by Victoria Aveyard. First line: Clara Darden’s illustration class at the Grand Central School of Art, tucked under the copper eaves of the terminal, was unaffected by the trains that rumbled through ancient layers of Manhattan schist hundreds of feet below. Summary: For Clara, a struggling artist and illustration teacher, Grand Central School of Art is a stepping stone in the hopes of greater things to come. She has dreams of working for Vogue as an illustrator. By moving to New York City, she left behind everything but so far, things have not turned out the way she had planned. After her divorce, Virginia Clay has been trying to figure out how to support herself and her daughter after spending years as the wife of a powerful attorney. When she gets a job at Grand Central Terminal in the information booth, she does not realize how much it will change her life. She discovers a watercolor behind a cabinet in the old art school and it leads her on search for the artist and the history of the terminal. Highlights: I really enjoyed the character of Levon. He was fiery and temperamental. He portrays the iconic angsty artist. He had a rich back-story and little quirks that made him stand out. I wish that he were a real person so I could see some of the work that Davis describes in her novel. The descriptions of Grand Central were amazing. Google is my best friend when reading historical fiction. I am always pausing my reading to search for pictures or more information about places and characters. It is sad that the terminal was in such bad shape in the 70s and that at one point it was going to be torn down. I have never traveled to NYC but I have seen the station at Kansas City and if it is half as pretty as that, it would have been a shame to lose it. I have enjoyed the time jumps in Davis’ work. I think the thing that makes her work so great. She is able to switch between characters and time while keeping the flow of the story. I have not read her second book, The Address, yet but I am on hold for it now. Lowlights: The beginning was a little slow to start. Davis gave us some background on the characters plus some information about the time. Then the speed of the relationships went very fast. I was a little shocked by Virginia early on but she grew on me as I continued to read. One scene in particular stood out between Virginia and Dennis. FYI: If you like this try the novels of Susan Meissner. First line: “We should dress alike,” I said on that afternoon when life changed forever. Summary: In the latest historical novel by C.W. 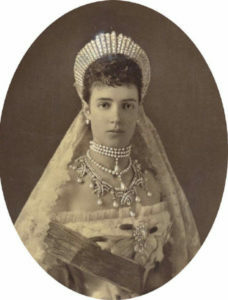 Gortner, we get the story of Minnie, the mother of the last tsar of Russia. Minnie is a princess of Denmark and destined to marry for an alliance. That marriage is to the future tsar of Russia, Alexander III. However, when trouble strikes the country the new tsar and tsarina must find a way to navigate the changing political climate before the country revolts. When Alexander dies unexpectedly, leaving their inexperienced son, Nicholas as tsar, Minnie must try to guide him before they lose their country forever. Highlights: I found Minnie to be a fascinating woman. I knew next to nothing about her other than what is portrayed in the movie, Anastasia. (She is the grandmother who is desperately searching to find out if her son, Nicholas, and his family survived the Russian Revolution). She sounds like a strong woman who had to try to survive in a very turbulent time. Russia has always been a country with struggles and that fact that she lived through them shows how smart she really was. It was difficult to keep track of all the relationships and marriages. I was constantly checking family trees and Wikipedia to figure out which character was which and how they played into the story of the Romanovs. Even knowing how the story ends, the Russian Revolution, I kept hoping for better for them. Gortner does an amazing job of describing the opulence of the Romanov court. I would love to see the Winter Palace and St. Petersburg. There is so much history and culture in Russia. However, the riches and luxury that the tsar and his court lived in is hard to imagine. How can someone live like that? It just boggles the mind. It is easy to see why the peasants revolted. They were starving while the royal family drank champagne. 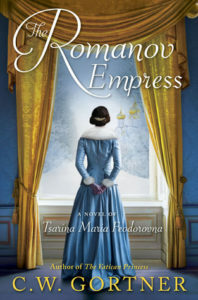 I remember when reading other novels about the Romanovs, that Alexandra was not very well liked. 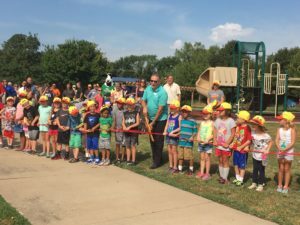 Gortner gives us a look into why. She seemed shy and anxious. But Minnie, as dowager empress with lots of experience with the Russian people, tried to teach her how to act and gain their respect. Their relationship was very volatile. It was sad to see how much dislike there was between the two women. Throughout the novel I was thrilled to see how well the author brought the history to life. This is one of the best written historical novels I have read in a long time. Lowlights: Do I have to have any lowlights? I think not. This book was great. Historical fiction is and always will be my favorite genre. FYI: Perfect for readers of Philippa Gregory and Alison Weir. First line: Morning light shimmers on the apricot horizon as I stand at the place where my baby boy rests. Summary: When the Bright family, Thomas, Pauline and their three daughters, decide that they are going to move to Philadelphia they believe that it will be a new start away from the sorrow of the last few months. Thomas is apprenticing his uncle’s mortuary business. This seems a strange place to bring a family after the loss of their infant son and brother but for Pauline it helps her heal and understand death better. But suddenly the war and the Spanish Flu descend on the family. They have to deal with more than they ever expected. 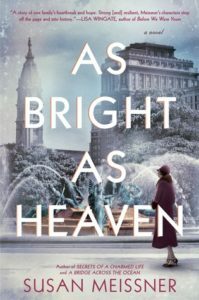 Highlights: Susan Meissner can write beautiful stories rich with historical detail and human emotion. Her characters are always amazing and deep. It was a very fitting time to read about the flu after the strong strain that hit the U.S. this year. 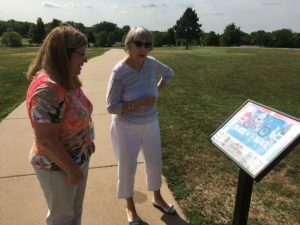 It is also the 100th anniversary of the epidemic. I liked the love stories and the history. 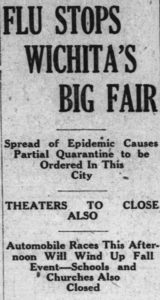 Of course I had to search Newspapers.com (using the link on our library website) to see how Wichita reported the events of the time. It seemed that the who country shut down to help protect civilians from the dreaded flu that was wiping out millions of people. Lowlights: I felt like the narratives of Pauline and Willa were not completely necessary. They did not provide too much to the story. The story could have been shortened by 50 pages or so. I ended up skimming the last 40 pages to see how the characters and story wrapped up. FYI: I loved her book, The Secrets of a Charmed Life, which is set during the Blitz in London during World War II.